Shohratgarh Envirnomnetal Society (SES) is a non -governmental organization. SES was informally born with issue of local safe drinking water issue in 1985. Over the years, SES has evolved to be a comprehensive NGO which works in the field of agriculture, food security, livelihood, health, education, disaster mitigation, WASH & environment. 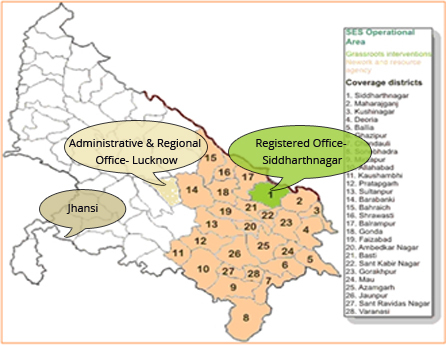 Since its origin, SES has been engaged with various development-plus programme. Various programmes are addressing issues of children, women, youth & unprivileged group. These programmes are based on community, gender participation & ethical ecological values. SES work with rural communities of Uttar Pradesh as well as unprivileged group in urban area of Uttar Pradesh. Role of SES is to play catalyst & facilitate the process at various levels. Over the years. Working For a Society Where Everyone Achieve Personal Happiness and Well-being. To bring social change involving knowledge sharing, capacity building, experimental learning and entrepreneurial development in sustainable ecological manner.